The Olympic gold medalist talks about what it's like to fail in front of 20,000 people. 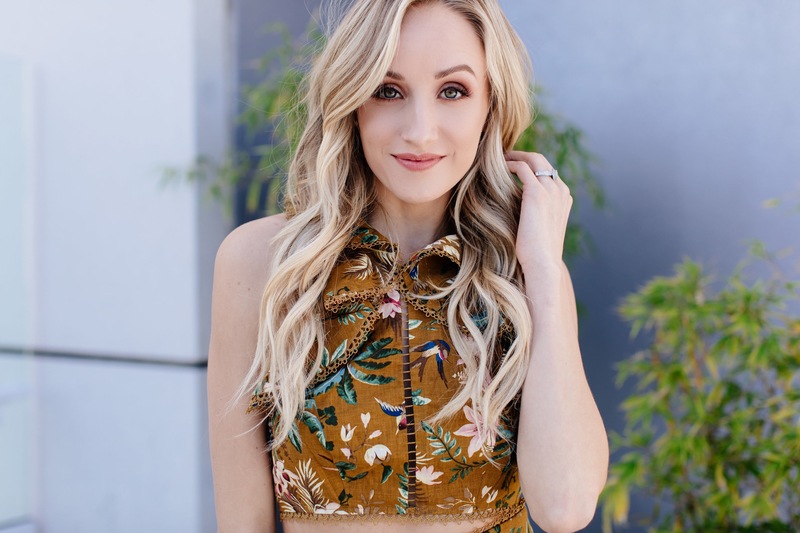 Nastia Liukin: I head downstairs and drink a glass of water with lemon. Then my fiancé and I make a Bulletproof coffee. We love taking time in the morning to set an intention for the day, whether that means writing in our journals, reading a book (currently reading Thrive by Arianna Huffington! ), or just discussing our goals together. Then we get to our phones and check texts, emails, and of course social media. NL: Working out. Even on those days when I really don’t feel like working out, I always remind myself how I feel after working out. I just have so much more energy when I constantly work out. NL: In my opinion, there is no secret life hack. There are no short cuts to success. It takes patience, passion, and persistence. NL: Not anymore. 🙂 I used to be super attached to it, but I have to give credit to my fiancé for this one. He decided our new rule was that we can’t have our phones in the bedroom with us, or else we will literally be on them until the second our eyes close. At first this was kinda hard, but now it’s great! I sleep so much better now since my mind is clear when going to sleep. NL: I’m the kind of person that doesn’t have a single unread email in my inbox. I typically like to reply to emails within 24 hours, and if I don’t get to it then I will “flag” it in my inbox so I don’t forget to reply! NL: Spend some quality time with my fiancé and family!! Life is so short. Never enough time to spend with your loved ones. NL: Hmm.. Probably my junior year at NYU. I decided I was going to be a full-time student in New York, AND do Dancing With The Stars, which of course is live in Los Angeles. The amount of red eyes I did that semester/season was crazy. I was definitely exhausted, stressed, and probably a little overworked with all of the traveling and rehearsals. The day I got back from the finale of DWTS, I had to get off the plane and go straight to NYU to take three finals. Needless to say, I survived, we got engaged a few weeks later and then enjoyed an amazing vacation together! NL: 2012 Olympic Trials. I went in as the reigning Olympic All-Around Champion. All eyes were on me. On my best event, I fell… face first. I was so embarrassed, I wanted to crawl under a rock. I got back up and finished my routine, knowing I had absolutely no chance of making my second Olympic Team. I landed on my feet, and for the first time in my entire life I had a standing ovation. 20,000 people were on their feet cheering for me, for the absolute worst routine of my career. When I won the Olympics four years prior, nobody stood on their feet. Sure they were cheering for me, but when I fell on my face in front of 20,000 people, when I finished that routine they all rose. It truly became the defining moment of my career. I also thought that in order for people to love and support me, I had to win, to be the best, to get a gold medal. The moment I had at the 2012 Olympic Trials made me realize life isn’t about winning, but more about the journey. NL: This one is actually something my mom taught me when I was a little girl… “Never quit on a bad day”—we will ALL have bad days in life, and it’s so important to not give up or quit on those bad days. TG: What is one technique you use to combat stress? NL: I love waking up early, somewhere between 5:00 AM and 6:00 AM, and reading a book or writing in my journal. I like to jot down my intentions for the day or any short term goals I have in mind, whether they’re personal or professional. This morning ritual brings a sense of focus and structure to the day ahead (and also allows me to catch up with all that’s happened so far on the East Coast). When I feel organized and prepared, I’m more calm. I don’t think stress is, per se, a bad thing or something that needs to be combatted. Stress can set fire to your feet and lead you to accomplish things you’ve only dreamed of accomplishing (if honed properly). What’s important is keeping your stress in check by practicing a technique, like the one I’ve described above, that brings you to your center whenever you begin to feel out of balance. TG: You recently shared via Instagram that writing down dreams is your number one tip for accountability, what are other ways that you hold yourself accountable to follow through with your goals? NL: Up until the Olympics in 2008, and even for the years following, I had always lived my life in four-year increments. Four years until Beijing. Four years until London. Four years at NYU. By virtue of that, I had, continually, a temporal marker by which I needed to be ready to execute whatever goal I had set for that specific increment of time. I’ve taken that practice and applied it to any goals I’ve sought, both in my professional and personal life. I’ve found that giving myself deadlines, whether they’re 30 minutes or four years, is, for me, an effective motivator. TG: You seem to always be on the go, do you have any tips for avoiding burnout while traveling? NL: I think taking time for yourself is so important, whether that manifests as waking up a little earlier and enjoying a cup of coffee in your hotel robe before the day starts, or saying “no” to a late-night event and opting for a relaxing night in with a hot bath and room service. Also, proper sleep and nutrition are key for maintaining my stamina while on the road. Luckily, your body is able to talk to you when deficiencies in these areas arise. When I feel those first signs of burnout approaching, I’ve learned to recognize and give credence to them. I’ll listen to my body and give it what it needs in order to get back on track and back to an optimal state of cognitive functioning. NL: I’m always listening to music. Whether I’m in my car, in a hotel room, or at home cooking, my Sonos/Spotify are definitely in use. I’m a deeply nostalgic person, so I think music brings me a sense of comfort and warmth wherever I am in the world.